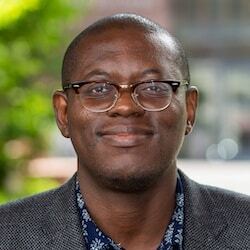 Bright Simons is the President of mPedigree, a social enterprise working on three continents with governments, Fortune 500 companies and activists to safeguard human health and food security using technology. A career inventor and innovator, his current projects include vaccine quality detection using novel organo-sensors. He is also a board-level advisor, with recent appointments to the Microsoft Africa Advisory Council, the Lancet Commission on the Future of Health in Africa, the Center for Global Development’s Study Group on Technology, the World Economic Forum’s Africa Strategy Group, the Africa Population Health Research Center and IC Publications, owner of the New African magazine. Bright is a WEF Young Global Leader, TED Fellow, Aspen Braddock Fellow and the 2016 CNBC African Innovative Business Leader of the Year. In 2016, Fortune magazine named him on its list of World’s 50 Greatest Leaders. Feeling good about using an organic cotton tote bag for groceries, instead of disposable plastic bags? Research suggests that you'll need to use it 20,000 times to offset the high water costs of growing the cotton. That's just one example of the unseen web of impacts behind seemingly positive interventions, says Bright Simons, president of mPedigree. Interventions with more concrete impacts are more often penalized for their negative side effects, he says – but they're also more likely to scale. Simons explores the resulting paradox: The most scalable interventions become risk-averse, sacrificing innovation for growth.